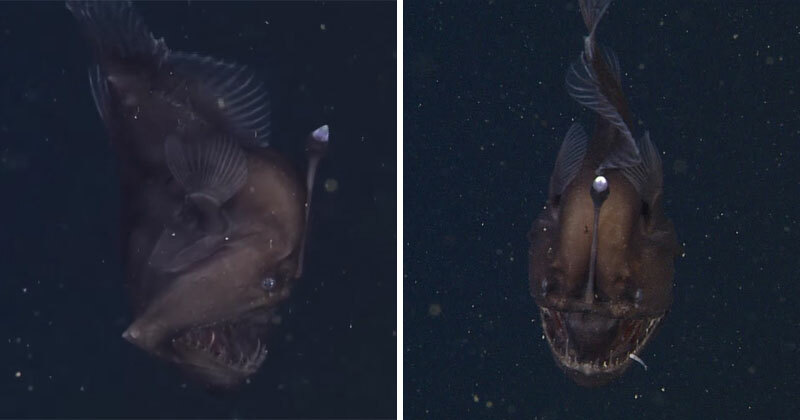 Deep-sea anglerfish are strange and elusive creatures that are very rarely observed in their natural habitat. Fewer than half a dozen have ever been captured on film or video by deep diving research vehicles. This little angler, about 9 cm long, is named Melanocetus. It is also known as the Black Seadevil and it lives in the deep dark waters of the Monterey Canyon. MBARI’s ROV Doc Ricketts observed this anglerfish for the first time at 600m (1968.5 ft) on a midwater research expedition in November 2014. The Monterey Bay Aquarium Research Institute believes that this is the first video footage ever made of this species alive and at depth.